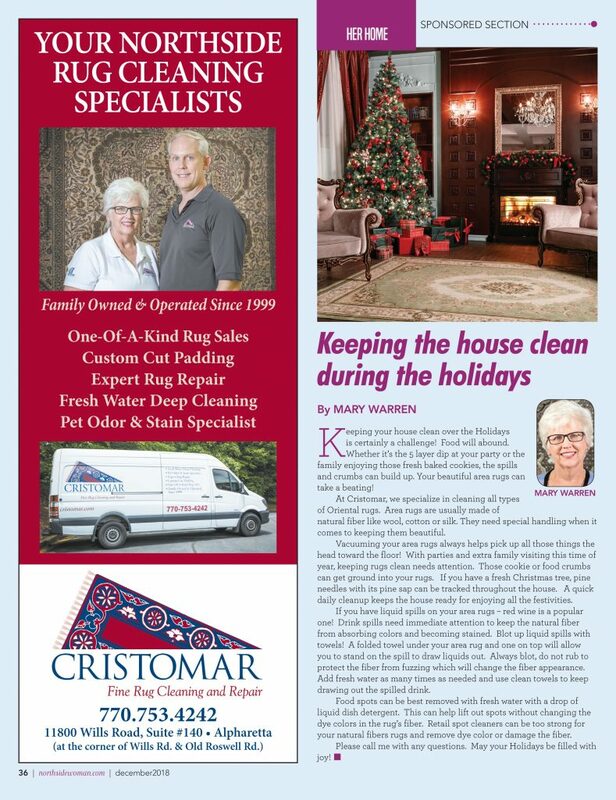 This is a sponsored news article, from “NSW” (Northside Woman Magazine), published (December, 2018) by Appen Media Group, Alpharetta, GA; with an article on “Keeping the house clean during the holidays”. Keeping your house clean over the Holidays is certainly a challenge! Food will abound. Whether it’s the 5 layer dip at your party or the family enjoying those fresh baked cookies, the spills and crumbs can build up. Your beautiful area rugs can take a beating! At Cristomar, we specialize in cleaning all types of Oriental rugs. Area rugs are usually made of natural fiber like wool, cotton or silk. They need special handling when it comes to keeping them beautiful. Vacuuming your area rugs always helps pick up all those things the head toward the floor! With parties and extra family visiting this time of year, keeping rugs clean needs attention. Those cookie or food crumbs can get ground into your rugs. If you have a fresh Christmas tree, pine needles with its pine sap can be tracked throughout the house. A quick daily cleanup keeps the house ready for enjoying all the festivities. If you have liquid spills on your area rugs – red wine is a popular one! Drink spills need immediate attention to keep the natural fiber from absorbing colors and becoming stained. Blot up liquid spills with towels! A folded towel under your area rug and one on top will allow you to stand on the spill to draw liquids out. Always blot, do not rub to protect the fiber from fuzzing which will change the fiber appearance. Add fresh water as many times as needed and use clean towels to keep drawing out the spilled drink. Food spots can be best removed with fresh water with a drop of liquid dish detergent. This can help lift out spots without changing the dye colors in the rug’s fiber. Retail spot cleaners can be too strong for your natural fibers rugs and remove dye color or damage the fiber. To contact Cristomar, you can use the “Contact Us” Tab and scroll down to “Drop Us a Note”; or call: 770-753-4242. We look forward to hearing from you so we can discuss the professional care for your antique, oriental or area rugs, “after-the-holidays”. You may also like our other Post published in the “Northside Woman Magazine“.